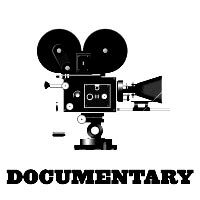 Documentary Films strictly speaking, are non-fictional, "slice of life" factual works of art - and sometimes known as cinema verite. For many years, as films became more narrative-based, documentaries branched out and took many forms since their early beginnings - some of which have been termed propagandistic or non-objective. The first official documentary or non-fiction narrative film was Robert Flaherty's Nanook of the North (1922), an ethnographic look at the harsh life of Canadian Inuit Eskimos living in the Arctic, although some of the film's scenes of obsolete customs were staged. Flaherty, often regarded as the "Father of the Documentary Film," also made the landmark film Moana (1926) about Samoan Pacific islanders, although it was less successful. [The term 'documentary' was first used in a review of Flaherty's 1926 film.] His first sound documentary feature film was Man of Aran (1934), regarding the rugged Aran islanders/fishermen located west of Ireland's Galway Bay. Flaherty's fourth (and last) major feature documentary was his most controversial, Louisiana Story (1948), filmed on location in Louisiana's wild bayou country. Merian C. Cooper and Ernest B. Schoedsack, better known for King Kong (1933), directed the landmark documentary Grass: A Nation's Battle for Life (1925), the first documentary epic, which traced the travels of the Bakhtyari tribe in Persia during their migrational wanderings to find fresh grazing lands. The filmmakers' next film was the part-adventure, travel documentary filmed on location in the Siamese (Thailand) jungle, Chang: A Drama of the Wilderness (1927), about a native tribal family. Other European documentary film-makers made a series of so-called non-fictional city symphonies. Alberto Cavalcanti and Walter Ruttman directed Berlin - Symphony of a Big City (1927, Ger.) about the German city in the late 1920s. Similarly, the Soviet Union's (and Dziga Vertov's) avante-garde, experimental documentary The Man with a Movie Camera (1929, USSR) presented typical daily life within several Soviet cities (Moscow, Kiev, Odessa) through an exhilarating montage technique. And French director Jean Vigo made On the Subject of Nice (1930). Sergei Eisenstein's October (Oktyabr)/10 Days That Shook the World (1928, USSR) re-enacted in documentary-style, the days surrounding the Bolshevik Revolution, to commemorate the event's 10th anniversary. Pare Lorentz' The Plow that Broke the Plains (1936) documented the deprivations and suffering of the Depression-Era Dust Bowl farmers. The film was subsidized by one of President Roosevelt's New Deal organizations. Lorentz' follow-up film was The River (1937), arguing that the Tennessee Valley Authority (TVA) aided ecological efforts in the area. Years later, Philippe Mora's Brother Can You Spare a Dime? (1975) compiled newsreel footage, film clips and music from the 1930s to capture the cultural and historical forces that existed during the decade. Michael Uys' and Lexy Lovell's Riding the Rails (1997) presented stories of train-hopping by Depression-era hobos, accompanied by Woody Guthrie's folk songs. Documentaries during the Great War and during WWII were often propagandistic. Innovative German film-maker Leni Riefenstahl's pioneering masterwork epic Triumph of the Will (1935, Germ.) was explicitly propagandistic yet historical in its spectacular yet horrifying documentation of the Nazi Party Congress rally in Nuremberg in 1934. It was a revolutionary film combining superb cinematography and editing of Third Reich propaganda. She also documented the 1936 Berlin Olympics in the stunning film Olympia (1938, Germ.) - with graceful and beautiful images of 'Aryan' athletes in competition. To respond to the Nazi propaganda, Frank Capra was commissioned by the US War Department to direct seven films in a Why We Fight (1943) series of narrated WWII newsreel-style films. The first in the series, "Prelude to War," a look at the events from 1931-1939, won the Academy Award for Best Documentary in 1942. David Lean's and Noel Coward's In Which We Serve (1942, UK) was not a pure documentary film, although it boosted the wartime morale of the beleaguered Britishers. The Oscar-winning wartime documentary The Memphis Belle (1944), directed by famed William Wyler (then a Lieutenant Colonel) and released by the War Department, presented real-life footage of dozens of Allied bombing missions by the Flying Fortress' B-17 bomber during the war. A Hollywood-style, sentimental version of this documentary, Memphis Belle (1990), starred Matthew Modine and Eric Stoltz. Director Alain Resnais' Night and Fog (aka Nuit et Brouillard) (1955, Fr.) harshly judged the Nazis for inflicting the horrors of the Holocaust on the world. Marcel Ophuls' four-hour epic The Sorrow and the Pity (1971) (aka Le Chagrin et La Pitie), mentioned in Woody Allen's Annie Hall (1977), used an interview technique and archival footage to tell the story of the Nazi occupation of France and subsequent French collaboration. Claude Lanzmann's unforgettable, eloquent 570-minute epic Shoah (1985) (Hebrew for 'annihilation') documented the personal experiences of several death-camp survivors of the Holocaust through interviews.